Yes equities are cheap when compared to bond yields and trailing earnings and hence simple historic price earnings ratios. 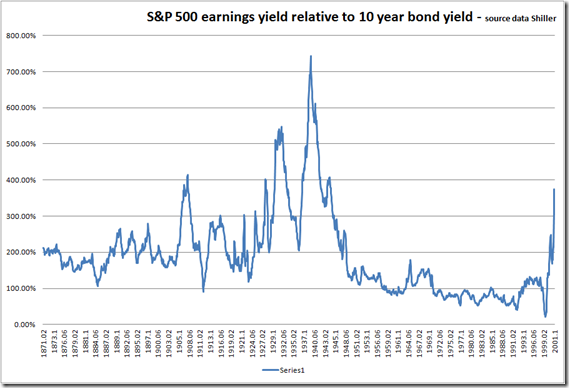 Additionally, we need to adjust for the cyclical nature of earnings: if we adjust for Shiller’s real price to 10 year real earnings we find that the market is not as under valued as one would assume. Indeed, the market would appear under valued, but not anywhere near the under valuation seen if we look just a current earnings yields. 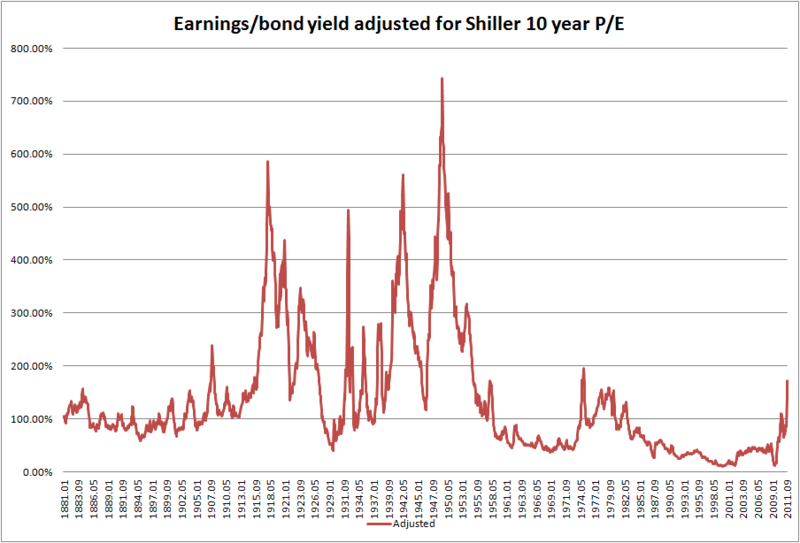 The above chart uses the trailing Shiller P/E of 9.07 of June 1949 as the benchmark. 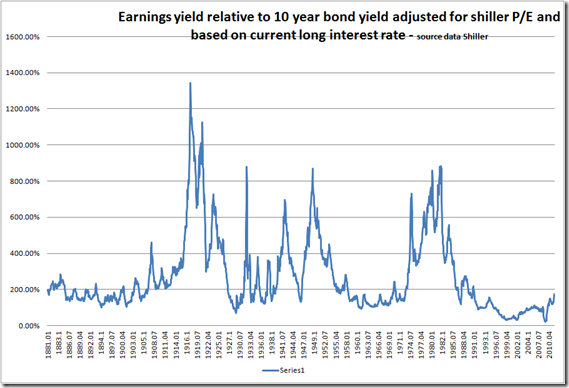 However, bond yields are artificially low, and basing valuation on such low yields is a bit like saying 0 degrees Celsius is a sweltering day in January in Toronto. Today’s low bond yields are more indicative of significant risk to bond returns than extreme equity value. 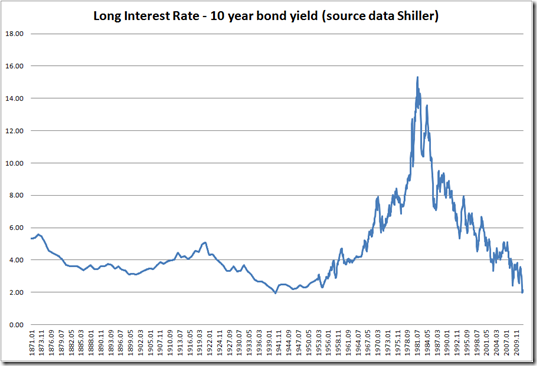 Low bond yields in the presence of immense excess global debt are signalling deflationary risks, and deflation means a high risk of capital destruction and significant declines in earnings as a) capital is written off and b) nominal revenue declines. 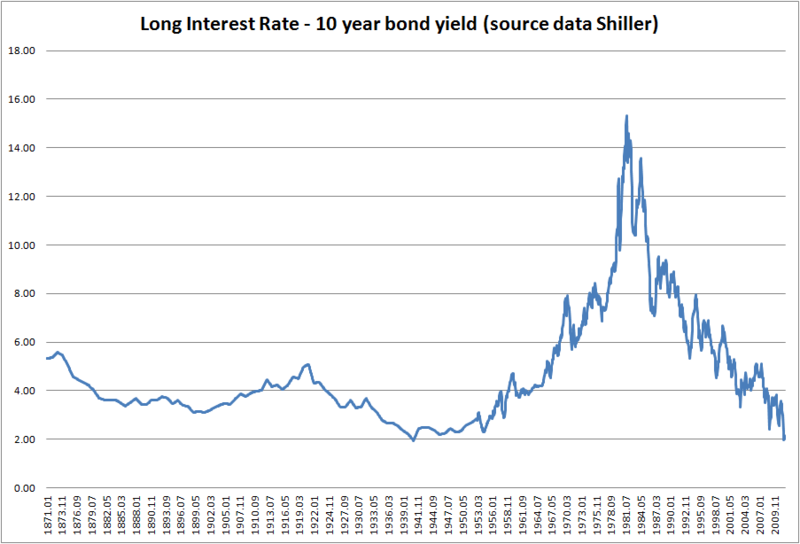 Low interest rates imply stress and low valuations an attempt to discount these risks. 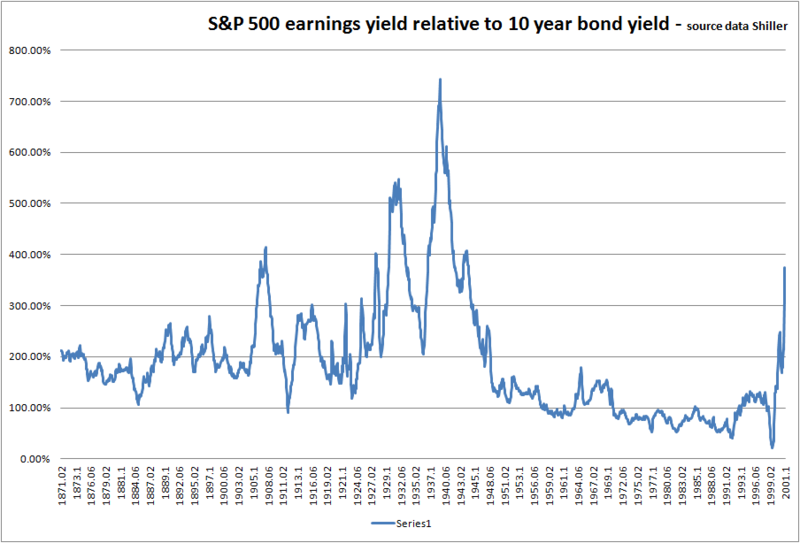 So what if we were to look at earnings yields and real trailing P/Es in the context of today’s bond yields. Well we would get the following graph. 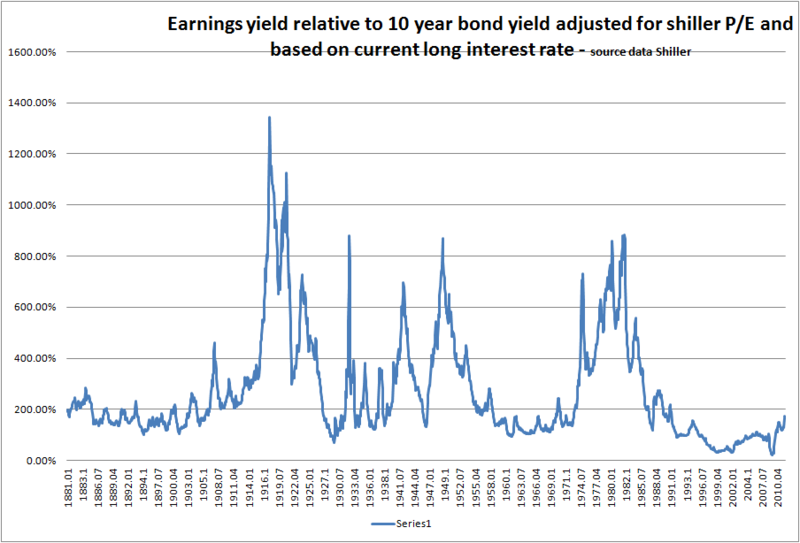 In fact, this would suggest that the market, in terms of historical earnings yield value, is over valued. Historically we have seen better value (more bang for your buck). 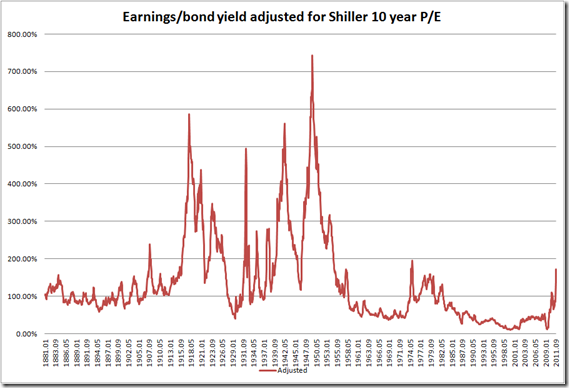 Moreover, if current real earnings have been inflated because of debt dynamics and other factors, then the Shiller real P/E could be higher and the actual real valuation of the market, higher still. Are there arguments which would support the arguments of the last graph? 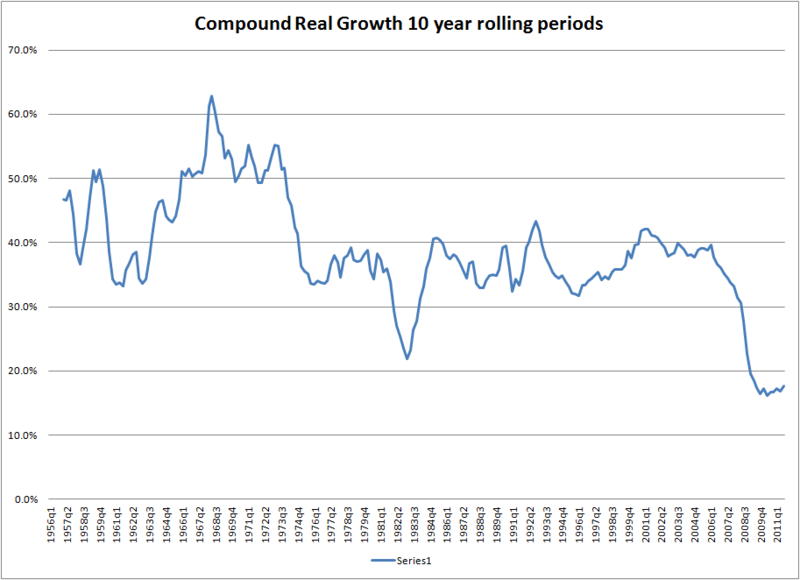 The following chart shows compound real growth over rolling 10 year periods starting Q1 1956 (effectively Q1 1946) to Q3 2011 for the US economy. If we were to adjust for debt expansion we would probably have seen a steady decline in real growth from the 1990s onwards. The bubbling collapse of the financial system as it tries to delever has seen a significant fall in real growth and we may not yet have seen the finale. 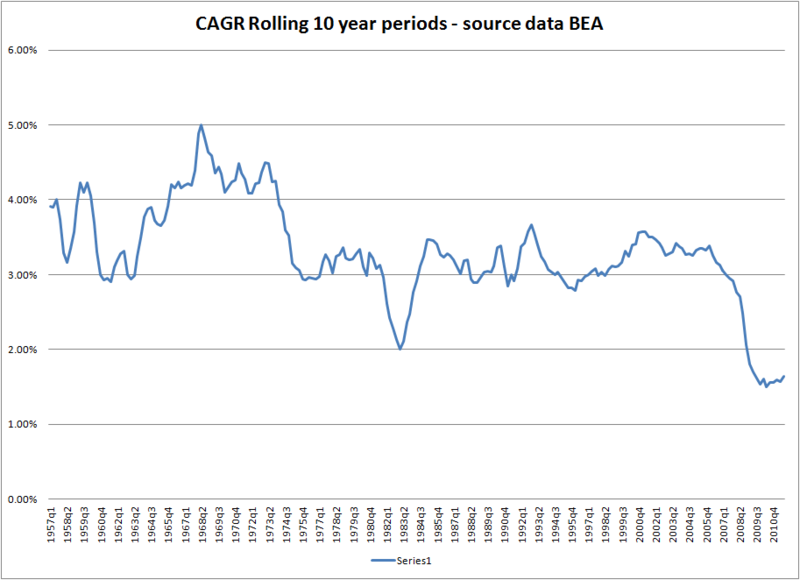 The troubling aspect is that to date total debt has been increasing (even though consumer debt in many countries has been falling), leading one to expect short term growth to dip below the 1.5% CAGR seen in the latest 10 year rolling periods. 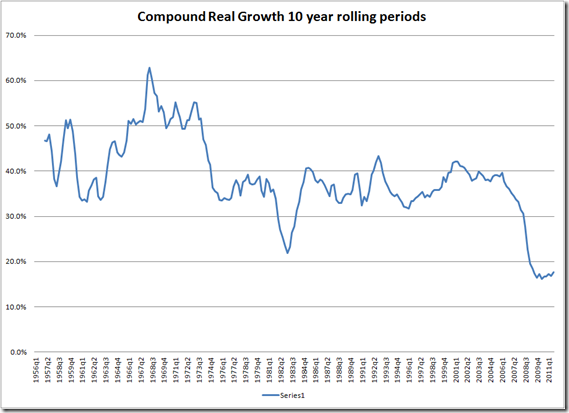 Real GDP growth of less than 50% of historical growth rates would severely dent the valuation arguments that are currently being espoused in the market place. Secondly, profitability amongst companies is at historical highs, especially in the US and there are many reasons why earnings and earnings growth could stagnate from this point on. Historical valuation benchmarks which do not adjust for the fact that we are in a long term deleveraging cycle, that profit margins are at historically high levels and that low bond yields reflect risk factors which are likely to impact equity returns going forward are unrealistic. Going forward we may be lucky to see 0.5% real growth per annum for a number of years, inflation may less than 2% in a deflationary cycle and dividend growth may stagnate. Higher risks require higher returns and with lower growth expectations current valuations need to adjust. 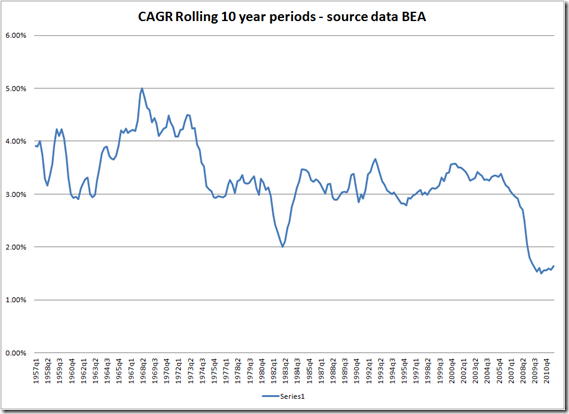 It is likely that current valuations are adjusting for a significant level of risk but they do not offer great value. As it stands, the only hope for markets to rise in the short term is for the type of moral hazards that might lead investors to play the markets for short term, significant, but uncertain gains. This entry was posted in Investing, valuation by Depthdynamics. Bookmark the permalink.